The Learned Fangirl talks about a (sadly not online) article in the December issue of Decibel which tackles the female un-friendly attitude over at DC. While the debate is hardly new for comics folks, it's surprising to see it turn up over in "America's only extreme music magazine." Erika D. Peterman interviews Cheryl Lynn Eaton about the Ormes Society for CNN. "We don't look the same, we don't create the same work, we don't read the same comics, but we'd all like to be respected, please." Doc Jenkins presents a Comics and Graphic Storytelling syllabus "which is designed to expose students to a range of different methods for studying the medium and to as broad a sample of (primarily) American comics and graphic storytelling as I could cram into one subject." A lot of the usual suspects show up in the reading list -- Eisner, McCloud, Spigelman, etc. -- but there's also other less well-known folks like Howard Cruise and Ho Che Anderson. Jenkins' stuff is always worth a read, but with my (and presumably your) interest in comics, this is particularly relevant. 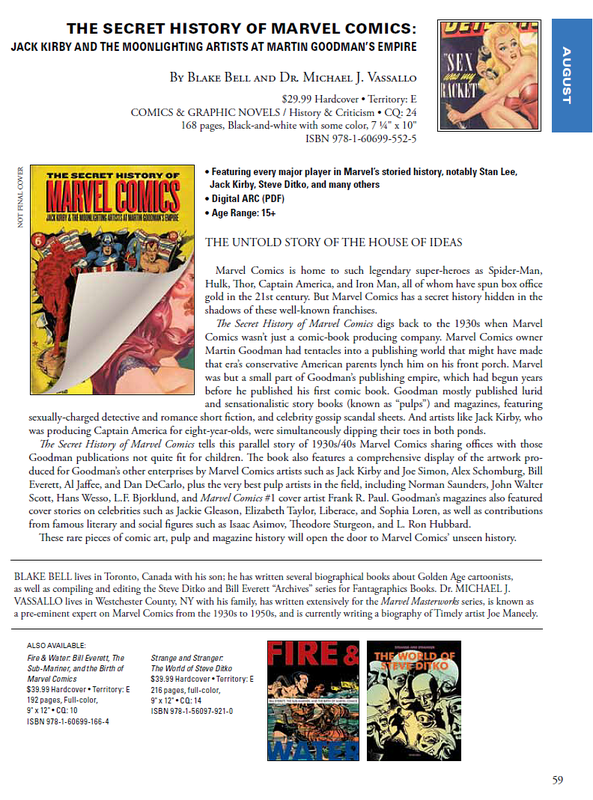 Blake Bell points to this image showing the Fantagraphics catalog entry for The Secret History Of Marvel Comics: Jack Kirby and the Moonlighting Artists at Martin Goodman’s Empire. The Globe and Mail takes a look at how tablet sales are a boon for digital comics.